Sebas Velasco has drawn since he was a small child, but it was in 2004 when he began painting graffiti on the walls of his home town. Afterwards, he moved to Bilbao where he graduated in Fine Arts, getting in touch with and specializing in painting.Sebastian Velasco deals with an enviable technique naturalism. His “canvases” are mainly the walls and tables. Materials used are oil, acrylic, spray and pencils. the “Antonio Gala Foundation” to take part in an Artistic residence grant, where he is about to finish his painting Project “Around the Wall”.He has participated in fellowships like landscape Paular, organized by the Royal Academy of San Quirce Palacio Quintanar in Segovia. His work has been exhibited individually and collectively in various cities of northern Spain so, and has received several awards, including first prize in the second drawing international sports competition, organized by the Association of Catalan sports federations, or Prize Climent Muncunill for young artists. During all these years, Sebas has maintained a continuous activity in the Street, painting walls in different Spanish and European cities. It is in the streets where he finds inspiration for his studio work. 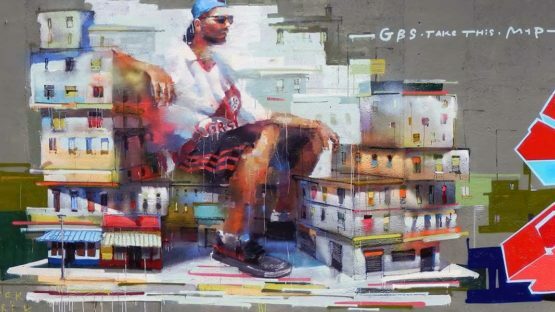 Thereby in “Public Provocations” show, he begins with graffiti writers in action and broadens his attention then to other concepts around it, such as Street-culture, architecture or nightlife. 2010 Group Exhibition "Speaking In Silver" Unit 3b Gallery, Sheffield.